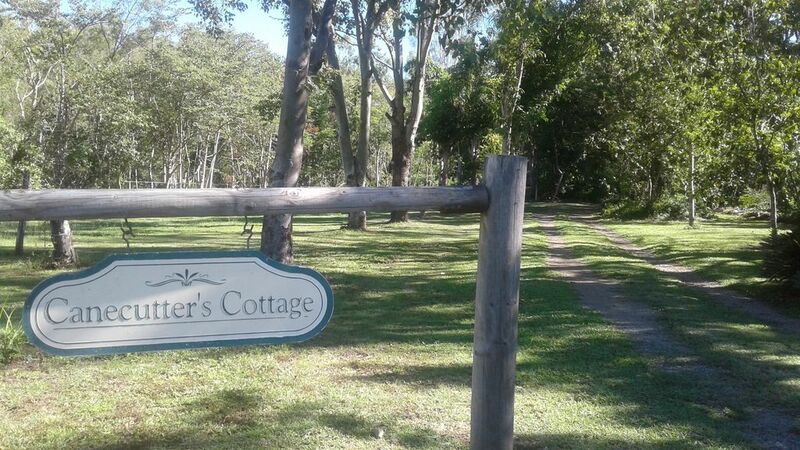 The Cane Cutter's Cottage is an idyllic retreat, quiet and peaceful, just 5 minutes away from the hustle of Airlie Beach and a million miles away in ambiance and relaxation. Completely private with its own driveway, you won't even see another house! Enjoy your own small house, fully equipped with attention to detail, quality linens, pillow choices, loads of towels, a full kitchen, coffee machine plus baby Weber bbq for outdoor dining in balmy tropical nights, with the scents of the frangipani and sounds of the rainforest. Where else can you watch wallabies while having breakfast and enjoy a luxuriant tropical garden with birds and butterflies, all to yourselves? The cottage has one bedroom with a Queen bed plus additional sleeping on a double sofa-bed if needed. A roll-away bed is also available for a child. Transport options are available, however while a car isn't essential, there is so much to see around the Whitsundays we do recommend a car rental - it would be a shame to miss out on off-the-beaten-track beach bars and restaurants that we can tell you about, rainforest walks and other interesting places to explore. Our little award-winning Cottage is located on a country property where doors don't need to be locked, You have your own private driveway to come and go as you like. And the main shopping centre is just a minute away. The Cottage is over 115 years old and was fully restored using all the original building materials to create a new kitchen and bathroom. It has recently been featured in a Pan MacMillan book of iconic Australian buildings and is used for photographic shoots and as an event/wedding venue. We are long term marine-tourism business owners, now semi-retired and enjoying sailing around the world, in past years from Alaska to the Antarctic and continuing a life of adventuring. We love sharing our 6 acres of Land for wildlife property with guests. And letting you know about the best things to do around the Whitsunday region. This cottage was an early Tiny House! Home to quite a large family, and quite basic (no bathroom in the old days!) rather than see the cottage destroyed, we opted to move it from the cane farm to our property and spend a year completely restoring it, from top to bottom. Adding a bathroom (shower with a twist on the classic bush shower!) and using the original roofing materials to create a modern kitchen it is truly a local classic and a perfect getaway spot. Bathroom with modern take on a traditional 'bush shower! Enjoy the river stone foot massage and organic shower soap. Washing machine. Toiletries and hair dryer provided. Guests love the peace of a quiet private home in a rural setting, with rainforest, tropical gardens and privacy. Less than 2km from the main shopping centre and 5 minutes to Airlie Beach. Dinging table in the kitchen. Plus table and chairs on the verandah. If you appreciate opportunities to experience something different, then the Cane Cutter’s Cottage is for you. It’s nestled in the privacy of the Pelt’s property and its central location makes it easy to explore the Oceanside or inland. The Pelt’s are experienced and consummate hosts, ready to assist if required or give you space to enjoy their piece of Queensland paradise. Suzette and Adrian's cottage is delightful. It has been painstakingly restored to provide a taste of living in a bygone era while enjoying all the modern comforts. The cottage is a quiet and beautiful retreat only a short drive to Cannonvale and Airlie Beach. We thoroughly enjoyed our stay and would love to stay again when we next visit the Whitsundays. We had a wonderful 2 night stay at Cane Cutters Cottage but wish that it could have been longer. From the beginning communication with Suzette was easy and we were provided with information for an easy and straightforward arrival. Some lovely little touches on arrival which were much appreciated. The cottage is absolutely gorgeous, beautifully decorated and so comfortable. The location was perfect-a short drive from Airlie beach but in its own peaceful and tranquil location. We decided to stay in and cook both nights because it is such a beautiful and relaxing place to spend time. I would definitely recommend staying here and we would love to return for another visit. Thank you for such a great stay. Beautiful little cottage. So quiet and peaceful and not even 10 minutes from the heart of Airlie. Totally what you would expect from a quaint Heritage Cottage, lots of charm and personality. Your hosts will make you feel welcome and they are very helpful. Lovely spot and I will definetely be back. Very relaxing! Loved the BBQ facilities. The Cane Cutters Cottage is located in a quiet neighborhood, next to rainforest and with daily visits by wallabies and birds. It has its own private driveway, sea glimpses through forest and lush surroundings. Less than 2 minutes away is the main shopping centre and in about 5 minutes you can be in the busy tourist village of Airlie Beach. Do what the locals do, and take the drive just a little further down the road from the Cottage to enjoy sundowners (or a meal?) at fabulous new Northerlies on the beach. It's where we go for island views and to watch the boats returning from a day sailing and the twinkling lights come on in Airlie Beach across the water. A short drive away is one of Australia's oldest rainforests - Conway National Park with a selection of walking trails, from short hr, to a 3 hr circuit.